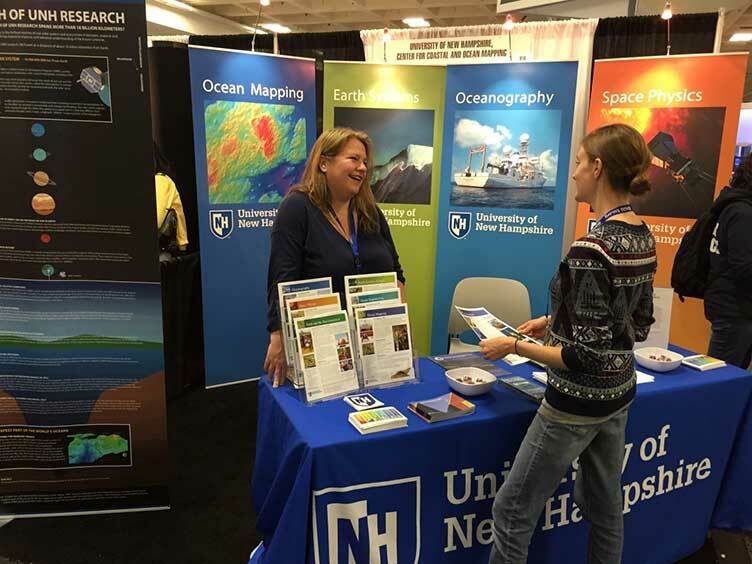 The UNH booth, hosted here by Tara Hicks Johnson, outreach specialist at the Center for Coastal and Ocean Mapping, was a popular destination for would-be graduate students and research collaborators. That eerie silence echoing the halls of some of UNH’s science buildings last week wasn’t just due to end-of-the-semester cramming. 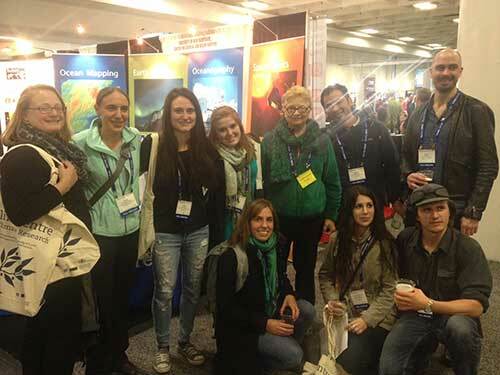 Rather, it was the absence of more than 100 faculty and students who had traveled to San Francisco to showcase their research at the American Geophysical Union’s (AGU) fall meeting there. 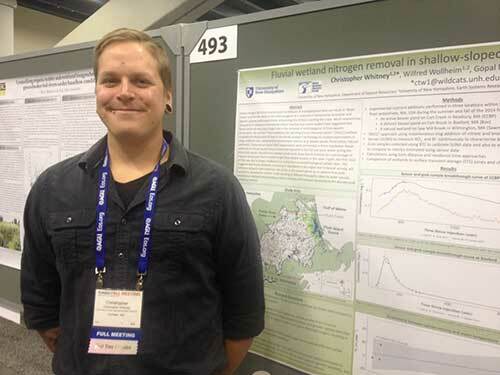 Chris Whitney was among many UNH Ph.D. students from the Natural Resources and Earth Systems Science program to present posters at the AGU fall meeting. UNH research wields an outsized influence on the meeting, fielding more presentations, posters and coauthorships of research than many much larger institutions. “I believe that UNH scientists are involved in a disproportionately large number of talks,” says Harlan Spence, director of UNH’s Institute for the Study of Earth, Oceans, and Space (EOS), which sent nearly all its researchers to the meeting. At a lunch ceremony during the meeting, Earth sciences professor Ruth Varner (far left) received AGU’s Sulzman Award for Excellence in Education and Mentoring. Many of her mentees from the Northern Ecosystems Research for Undergraduates program she directs joined her. Spence himself was involved in nearly 40 talks; other UNH research highlighted at the meeting spanned from deep below the Earth’s surface to the edge of the solar system. Earth sciences chair Julie Bryce presented new findings on volcanism; EOS researchers Muge Komurcu and Matt Huber and graduate student Jonathan Buzan detailed how they’re downscaling global climate models for regional impact; Joseph Dwyer, also from EOS, described the flight through a thunderstorm that led to a major lightning discovery (“I really thought I was going to die. But right there, something very interesting happened.”); space physics professor Roy Torbert was among many to report findings from the Magnetosphere Multiscale satellite mission that carries UNH-built instruments. 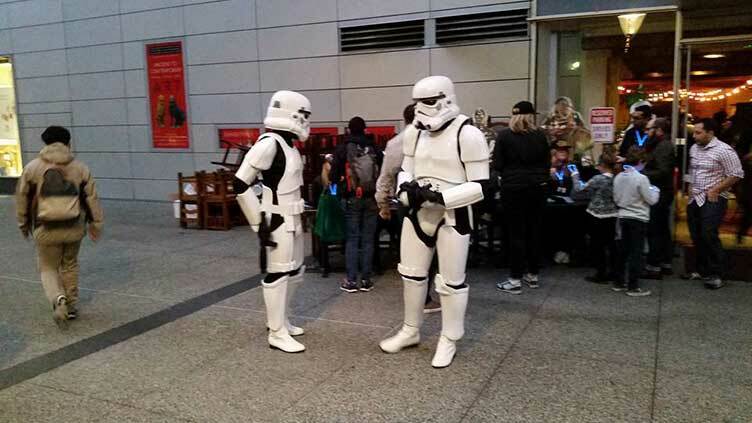 Traffic at the UNH booth on the exhibit floor of San Francisco’s rambling Moscone Center was brisk, with a steady flow of potential graduate students and research collaborators stopping by to learn about the university’s robust offerings. And it wasn’t all posters and PowerPoints: Nearly 150 UNH alumni, faculty and students gathered at a local watering hole for a reception hosted by the UNH Alumni Association in conjunction with UNH’s Center for Coastal and Ocean Mapping, EOS and the Leitzel Center, and industry partners QPS in Portsmouth and Kongsberg.